After our extensive, sleep deprived, delerium-inducing two days of travel, we woke up in a surprisingly pleasant atmosphere. The room was cool (air conditioning is key and sometimes uncommon) and the only bother during the night had been a few late-night partiers, which are pretty typical for hostels everywhere. The little bit of Bangkok nightlife that we had encountered on our way in was admittedly alluring, and it wasn’t difficult to understand what might drive a person to want to stay out until four or five in the morning. We also had a number of early risers, most of whom were scurrying off to do yoga or travel to other exotic places. Our first morning we were served a lovely breakfast from a nice Thai woman just outside our hostel. A small, functional shrine was set up among the tables and reclining mats that we ate on, and periodically the women from the food vending carts that lined the streets would come in and make offerings. The smell of incense was the delight of the optimistic travellers and the bane of the hungover ones. Fresh flowers, juices and fruits also decorated the shrine, and cleanish looking cats and geckos helped complete the scene. We met a small group of travellers from Illinois and ended up spending the day with them. 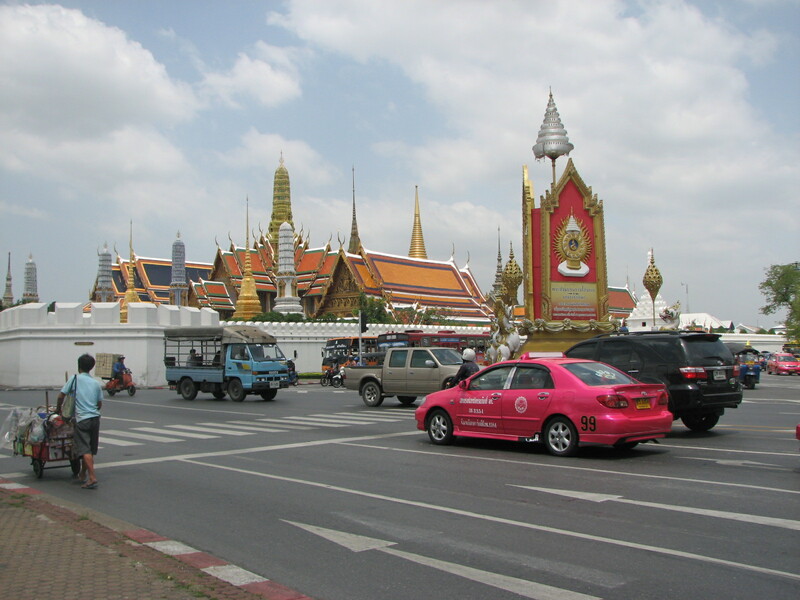 First we went to the Grand Palace, which was a powerful first impression of Bangkok. We were harassed by tuk-tuk drivers and a small mob of people trying to sell us pidgeon food/corn, but made it there unscammed. The Grand Palace was truly a sight to behold. 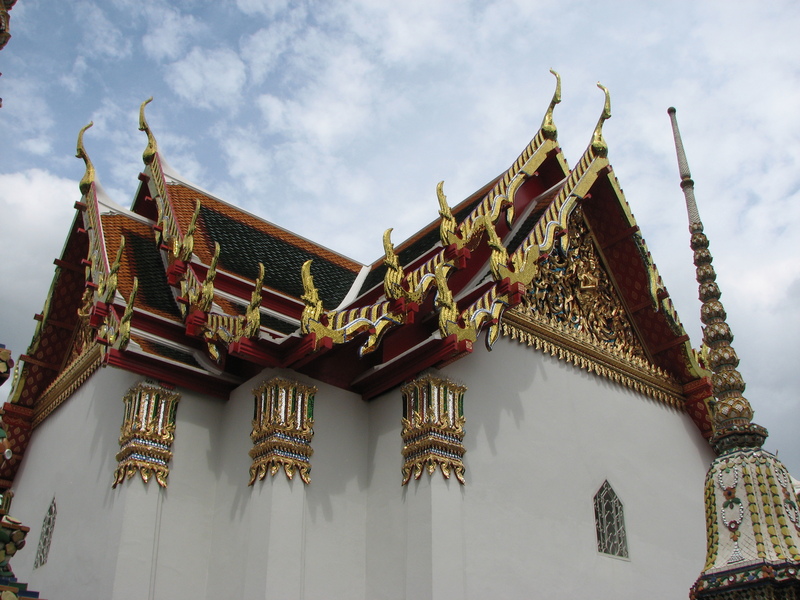 It is the first (and largest) temple that is approachable from Khao San Rd, and its glittering, elegantly jagged spikes made a formidable first impression. The interior was no less dazzling, and we meandered through smaller temples, shrines and statues for about an hour. After we went to the Grand Palace we stopped for some food at a local vendor. The chefs and vendors were all very friendly, and our delicious meal came to 30 baht, or about one American dollar. We ended our day at the market at Khao San Rd, and took pleasure in perusing the merchandise. The vendors and tuk-tuk (rickshaw) drivers there are pushy, but can be fairly easily avoided. Oftentimes, you can talk the sellers down from their asking prices and get even more impressive bargains. Most items cost between 25 and 300 baht before the bargain, and the items are of comparable quality to what you might get in stores in North America. The next few days were a whirlwind of wat (temple) visiting, shopping and exploring. We made new friends, including a group of Irish men and a new friend, Kevin, from California. We visited seveal wats (temples) and saw the gigantic Reclining Buddha. In the evening we got fish pedicures (follow up post to come! ), ate at a lovely restaurant and enjoyed the night life. “Gross” referred to the air in Beijing. Beautiful Russian Girl looking for Marriage with a Foreign Man! WTF Google. Anyway, looks like you’re having a good time, looking forward to reading [and seeing] more.